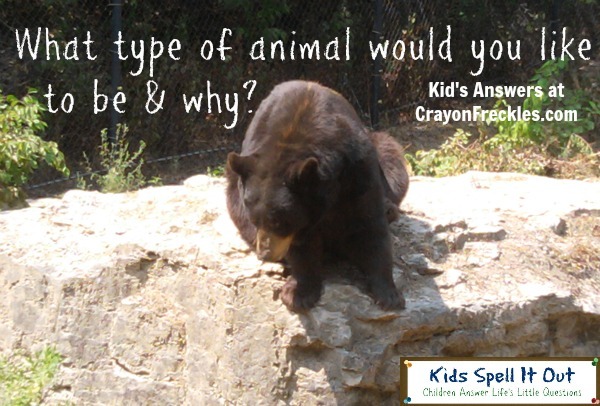 Crayon Freckles: Kids Spell It Out: What type of animal would you like to be? Kids Spell It Out: What type of animal would you like to be? What type of animal would you like to be? A giraffe, cuz I'd try to grab tree branches to play with them to hook them on trees so I could eat it. I don't want to be an animal, because I don't want to make animal noises. Are there any animals that don't make noises? Lion because they are cool. A dog, just because I do. Caterpillar, because they turn into butterflies. A tiger, because, you know how tigers like to scratch up trees to keep other tigers away? Well, I'd do that to keep away my brothers because they're great big turds. A bunny because it is cute! A turtle because I could swim in the water. A dog because puppies are the cutest dogs and once they are grown up, they bark very loud and can wake you up in the morning. Cat. Meow. Why? Meow, meow. Crocodile, because I want to. I would like to be a giraffe with a big, long neck to reach up to the trees. Cause that's my favorite animal. And Tyrannosaurus Rex is my favorite animal too. I want to be a horse, because I want to have a rider and ride super fast with him. And jump over little thingies and swim with my rider, but my rider is a kid. A giraffe because they have long legs. That's a hard question but I would say probably a bird so that I could fly around the world. A cheetah... because they're fast! I want to be a monkey, because PollyAnne [step-mom] calls me a monkey. I would be a snake, because snakes are my favorite animal. A cat because cats are very nice and they don't wake you up. And they bite, but not always. I love these answers! Each child came up with something uniquely there own.